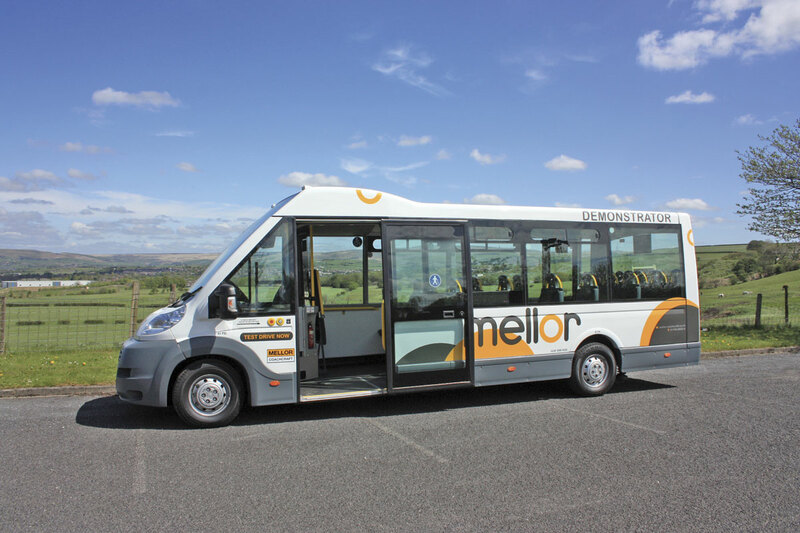 Mellor Coachcraft at Rochdale has now fully absorbed manufacture of the Orion low floored, directly wheelchair accessible minibus into its production system. Two basic versions are produced. One has wheelchair accessibility via the front entrance or through the rear doors and a shallow ramp. This version is primarily aimed at community transport groups, health and social services organisations. 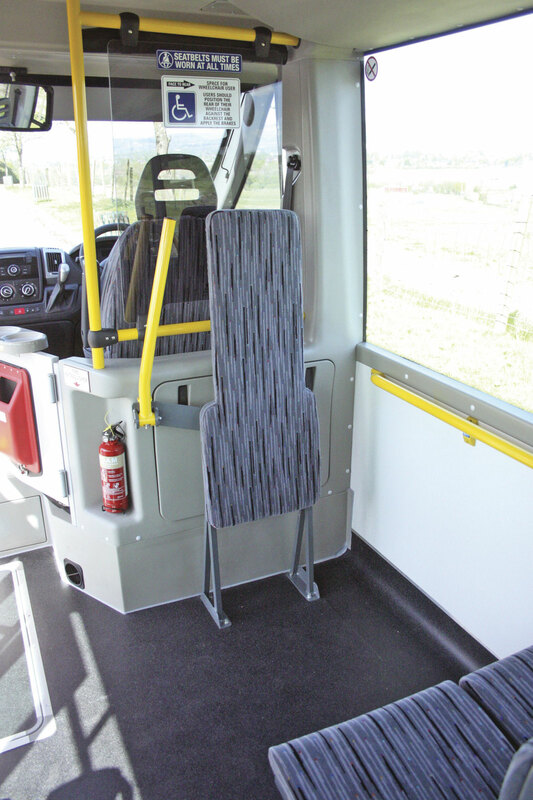 The second version which has wheelchair access only via the front entrance is designed specifically for service bus operations and it is upon this version that I am concentrating in this article. Bluebird Vehicles who originally developed and produced the Orion design, before the Intellectual Property Rights for the product were sold to the Woodall-Nicholson Group, owners of Mellor Coachcraft, had already achieved some success in selling the Orion as a service bus, but Mellor are taking that to a new level and are reaping the rewards for so doing. Some in the industry continue to question whether there is a place in the market for a small lightweight, relatively low cost service bus, arguing that such operations demand stronger more durable vehicles to cope with the arduous nature of continual service bus operation. As many have already shown, if utilised correctly, the lightweight bus can perform well, often enabling services to be opened up or retained when the costs of purchasing, running and maintaining a more conventional service bus would be prohibitive. For many organisations particularly local authorities, health and education bodies the reduction in central funding has meant they have had to take a long hard look at the types of vehicles they run and how they run them. The days of a vehicle doing a couple of schools or special needs runs in the morning, a return in the afternoon and being parked up idle for most of the day, are gone. It just isn’t financially viable. 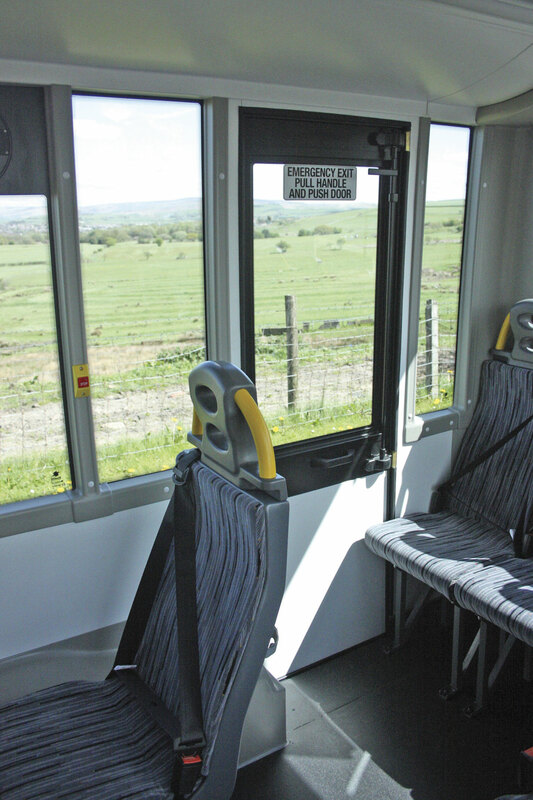 Another key area is vulnerable but vital bus services, particularly those in rural areas. Over the past few years we have seen some draconian measures taken by local authorities with regard to the removal of subsidy for vulnerable bus services. In some Counties, such as Cumbria, they have just been simply swept away, leaving isolated and disadvantaged people with no public transport whatsoever. Others have taken a more pragmatic approach and looked for ways that they can still maintain these vital services but at reduced cost. 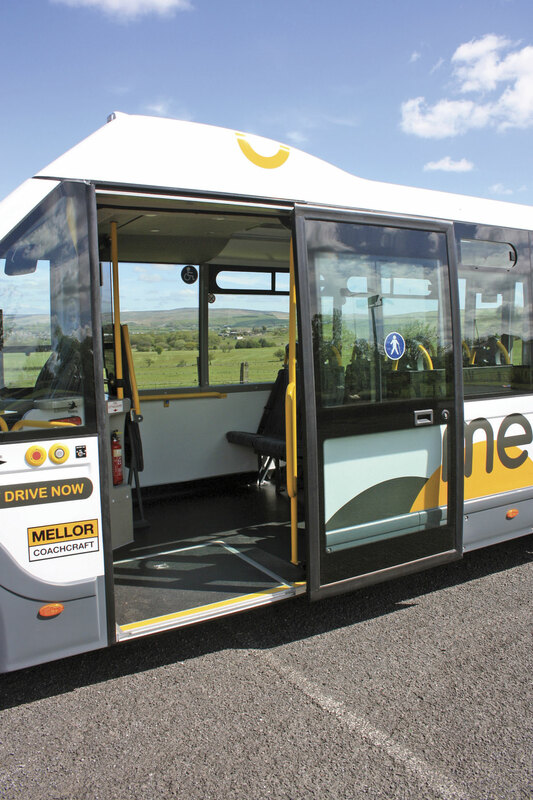 This is where the Mellor Orion service bus can provide an answer. Its lower initial cost and lower running costs, particularly fuel, compared to a conventional bus, mean that it can potentially be the difference between whether an operator can maintain a service or not. It really is a case of looking closely at the proposed operation and deciding which type of vehicle is best for the job. You wouldn’t put a lightweight bus into service on a route with heavy demand where it was going to spend most of the day carrying a full load, which would be unwise. Some have tried to do that and been surprised when they hit problems. Where it does work is where loadings are relatively light, particularly for bringing people in from outlying areas to hubs for onward transport by more conventional bus services. Many operators have found that this system works very well. 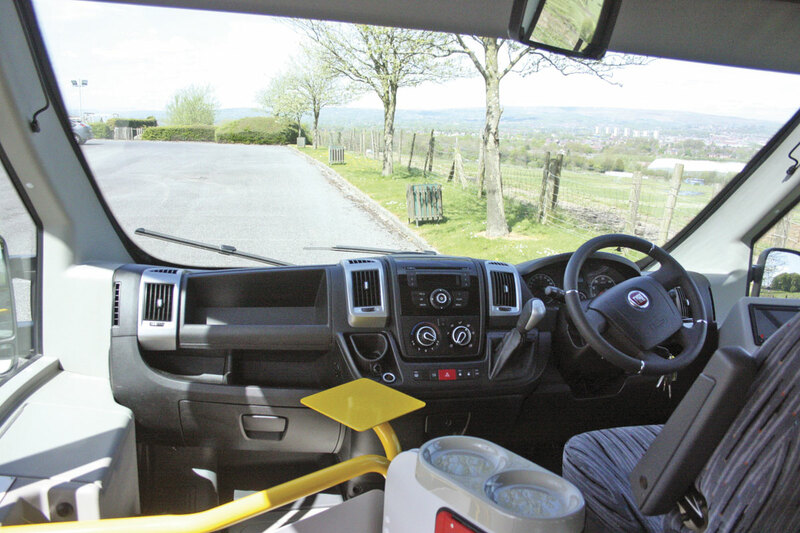 The flexibility of the Orion design means that the interior can be set up to suit a variety of operations. 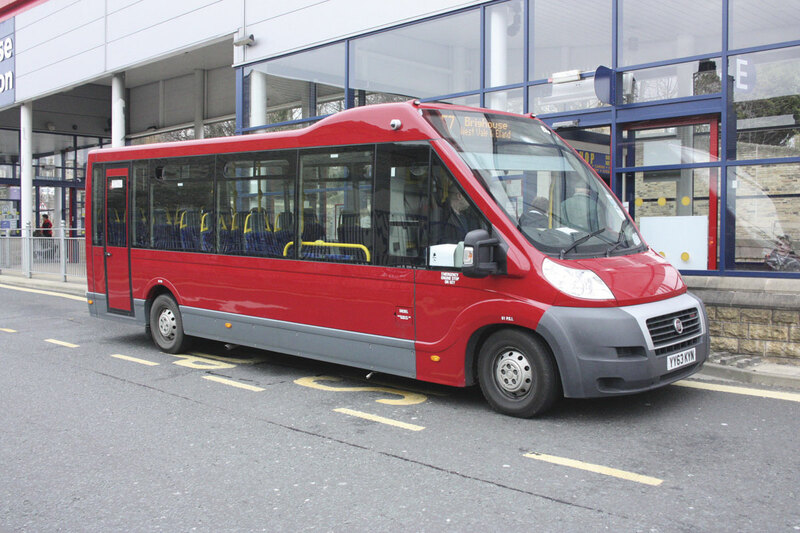 Many simply operate them as conventional service buses with a single rear facing wheelchair bay at the front, the same as on most other service buses. But for others who need the vehicle to cover different duties, for example part service bus work and part movement of people in wheelchairs, the flexibility of the Orion allows that. The floor can be fully tracked to take a number of wheelchairs for part of its duty, operate as a dual wheelchair vehicle and service bus for another or as a complete service bus for another. These days, with seats like Rescroft’s CT Space or the Phoenix Shuffle, you don’t even need to remove seats they simply have fold up cushions and can then be slid along the tracks to pack together and create the wheelchair spaces. I talked to Geoff Hudson, MD of Mellor Coachcraft about what they have done with the product since acquiring it last year. Geoff explained that the first thing they had to do was work out a way that the production of the new models could be integrated into Mellor’s already cramped production facility at Rochdale so as not to impinge on production of the more conventional coachbuilt vehicles that Mellor build. The key lay in the skills of Brian Davidson owner of Woodall-Nicholson Group. Brian is well known for his expertise in sorting out production facilities. He is the man who revolutionised the production systems at the Dennis chassis factory of ADL and the Plaxton facility at Scarborough and he has done similar exercises for other industries. ‘The key,’ said Geoff,’ was to increase our productive capability.’ Anyone familiar with the Mellor factory will know that it was in effect a series of rooms joined together which meant that vehicles being built had to be constantly moved and re-positioned. There was no possibility of expanding the actual size of the building because Mellor occupies a very tight site which currently cannot be expanded. What Brian Davidson did was to open up the whole building so it became one massive production shop by removing all the walls. It was quite an exercise bearing in mind that it had to be done whilst vehicle production was maintained. Into the space Brian organised for there to be two full length production lines capable of building any model from the range. He introduced just in time manufacturing whereby all the parts for a vehicle arrive at the appointed point on the line just as they are needed by the build crews to put on the vehicle. All the dirty operations such as framing etc. are carried out at in one enclosed area at the far end of the building, the vehicles then move down the lines to receive cladding, trimming and finishing arriving at the other end as a complete vehicle ready for final inspection, PDI, final valeting and despatch to the customer. Build crews are responsible for their own stages of the build, which is programmed against strict criteria, and they take responsibility for seeing that the work is carried out correctly. If it isn’t they have to carry out the rectification in their own time and in a way that does not hold up the work of the next team. The result of this is that they have been able to raise production levels substantially and yet achieve some of the highest quality levels they have ever achieved. B.E.S. produce the special low floor chassis with its trailing link rear suspension and attach it to the Fiat Ducato Maxi front power unit. The remainder of the bus is then framed in aluminium alloy and the wiring for the body systems fitted. The vehicle is then transported down to Rochdale where it is fed onto the production line to receive its fibreglass moulded cladding and glazing before being fully trimmed and fitted with all the various systems such as heating and ventilation, power door, seating etc. It emerges at the end of the line as a fully completed minibus ready for delivery to the customer. So what is the Mellor Orion? As mentioned previously it is basically the amalgam of a Fiat Ducato Maxi front end to an aluminium alloy framed body and a low line chassis with trailing link suspension. The body structure meets all the required legislative standards and the product carries IVA Small Series Type Approval. The Orion Service Bus in standard form is 7.772m long, 2.2m wide and 2.645m high. It has a 4.80m wheelbase. The drive system uses a Fiat Ducato Maxi front wheel drive unit fitted with the 3.0-litre four-cylinder Multijet 180 diesel engine to Euro6 developing 177bhp(130kW) at 3,500 rpm and with an impressive maximum torque figure of 400Nm available across a wide speed range. The engine is matched to a six-speed automated ComfortMatic transmission. This is actually the same transmission used by Iveco in the Daily (as indeed is the engine) and is called the Agile transmission. This has recently been replaced in the Iveco New Daily by a new ZF fully automatic eight-speed transmission called the Hi-Matic, which has been very well received, and it is reasonable to assume that this transmission will also feed on to the Ducato, probably in 2016. The front suspension is McPherson type with coil springs, shock absorbers and anti-roll bar. The rear suspension is a trailing link system utilising a Fiat Ducato rear axle with coil springs, hydraulic shock absorbers and anti-roll bar. There is an air option at the rear using two bellows. The axles are rated at 2.1 tonnes on the front and 2.9 tonnes at the rear giving a GVW of five tonnes. Braking is by discs all round. Wheels are 16in diameter steel units shod with 225/75 R 16 tyres. The Orion features a 950mm wide front entrance and is fitted with a glazed, rapid action, electrically operated, sliding, plug door. The entrance is a single step leading to a completely flat floor and for wheelchair access there is a fold out ramp. Step height is only 310mm from the ground meaning that when operating against a standard kerb most wheelchair users can actually access the vehicle without needing the ramp. The flat floor is made of a lightweight composite material and is covered in non-slip flooring. 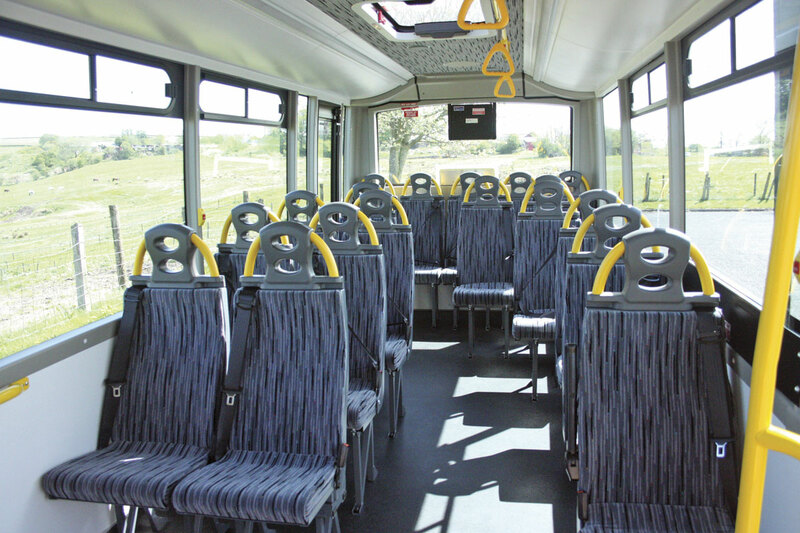 Seating can provide for 20 passengers when not carrying a wheelchair and additionally the vehicle can carry two standees. Various seats are available but the vehicle I inspected was fitted with Rescroft Ultra-lite’s with all age belts. In the 20 seat configuration 16 of the seats are fixed high back units with grab handles and two opposite the wheelchair bay have fold up seat cushions. There are also two fold down units mounted on the offside in the wheelchair bay. Some operators prefer to delete the tip ups in which case the standee capacity rises to four to maintain the maximum carrying capacity of 22. When a wheelchair is carried, seating capacity is reduced by two or four depending which seating configuration has been selected and the standee capacity is zero. The Orion is also available with a slightly shorter overall length of 7.41m with a maximum seating capacity of 16. Glazing uses large panoramic tinted units with two on each side incorporating top opening sliders. In addition there is a glazed, four way roof hatch. On the offside at the rear there is an outward opening emergency door. Heating uses an Eberspächer system ducted through the ceiling. The body is clad in fibreglass mouldings and is heavily insulated for temperature and noise using lightweight composite materials. The interior is trimmed in soft touch moulded trim panels. Lighting uses full length diffused units with an optional night time setting. 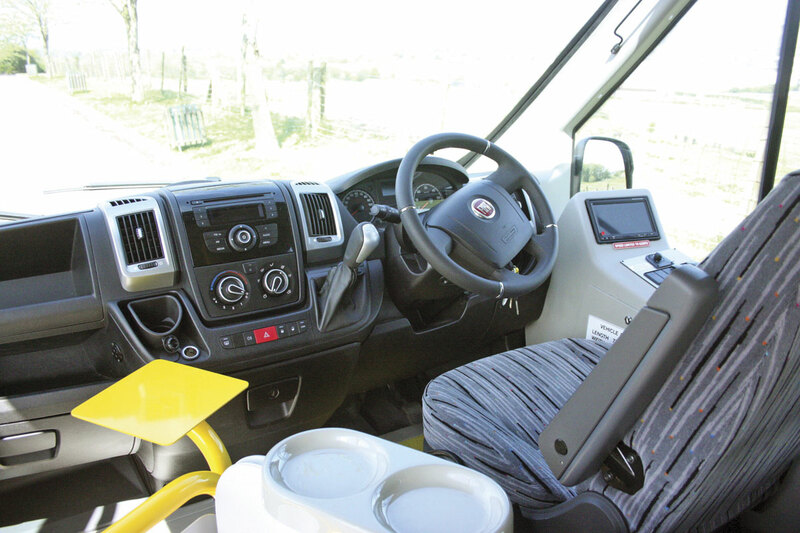 The cab is basically Fiat Ducato in terms of the driver with ergonomically laid out controls, instrumentation and systems. An additional control panel to the driver’s right is provided for the body systems and the vehicle has a reversing camera with audible buzzer and dash mounted screen. Alongside the driver there is a luggage pen. The driver’s cab is also fitted with a cab door, a position for mounting a ticket machine and the necessary electrics and a cash tray. Electronic destination equipment is fitted at the front behind the screen and at the rear using Mobitec units. 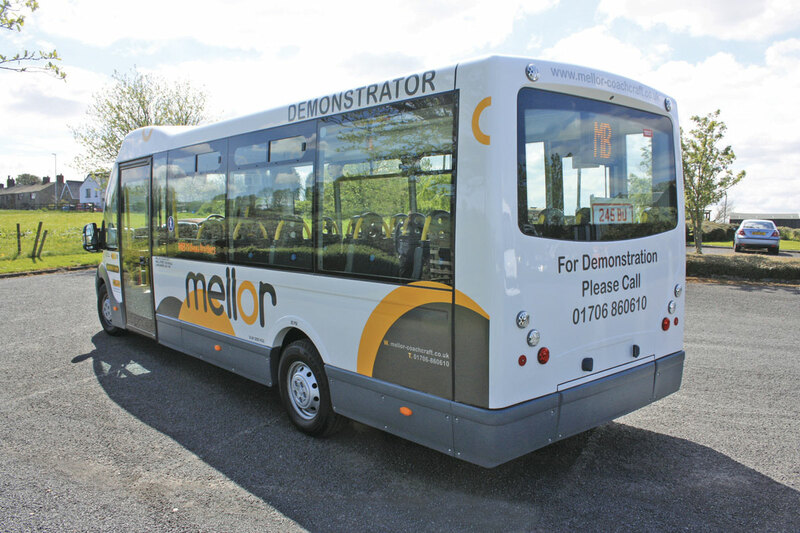 I took the new Mellor-produced Orion Service Bus demonstrator out to see how it performed on typical stage carriage operations. Rochdale is a good place to do this because not only has it got a typical urban road system with plenty of traffic, traffic lights and other traffic calming measures but also it is easy to get out of the urban area into more rural parts which feature some pretty stiff gradients, narrow roads and tight bends. In town I found the vehicle light to handle, very responsive and positive. The light positive powered steering and excellent suspension giving precision, security and manoeuvrability. The ComfortMatic transmission is not a fully automatic but if driven properly it approaches that standard. The secret is not to force it. If you let it do its thing it will make surprisingly quick and smooth changes up and down the box. Stopping frequently in the urban situation presented no problems whatsoever and pick up from stationary to normal traffic speed easily accomplished. I was also impressed by the speed of the opening and closing of the door. That’s important because with such a large door keeping it open too long could mean a marked drop in internal temperature. I did manage to confuse quite a few people who were waiting for the normal FirstGroup bus. The bus behaved perfectly in this urban situation and was very much akin to driving a small Optare Solo. Vision through the big screen is excellent and the rear view mirrors gave good clear imaging. The ride was comfortable as was the in-vehicle ambience. Heading out into the rural area you really appreciate the power of the Ducato Maxi’s 3.0-litre engine. There is bags of power and masses of torque. Tackling the hills proved to be no problem, it just sailed up them. Early versions of the automated transmissions could sometimes be troublesome on hills, having a habit of shuttling between gears as if not able to make its mind up which gear it wanted to be in. Changes to the programming and fine tuning of the systems controlling the transmission mean they rarely do this now. I would expect that if the Ducato does get the new Iveco Daily Hi-Matic automatic transmission this problem will disappear completely. You do of course have the option of changing the transmission manually. There is no clutch pedal involved so you are in effect simply holding the vehicle in a particular gear rather than letting it change itself. I sometimes use this on long hills more as a precaution against unwanted changes than anything else. Another useful feature of the transmission is the instant kick down which can be useful in tight spots. Dropping down some of the steep hills calls for measured braking but at all times I found it to be totally secure giving nice smooth, straight line stopping with plenty in reserve. Riding as a passenger in the vehicle you really appreciate the light and airy ambience of the vehicle and the excellent view from the massive windows. The seating was comfortable and supportive and the heating and ventilation gave a nice balance between warmth and freshness on what was quite a chilly day. The ride from the rear suspension was excellent with no nasty bumps and shocks and this vehicle had the coil sprung rear suspension. I was impressed with the quality of the build of the body as there was a solid integrity to it with an absence of shake and shimmer and no nasty squeaks and rubs from the fitting of the trim. It was a real credit to the staff at Mellor. To my mind there is no reason at all why the Orion cannot be used for service bus work. It is perfectly capable of doing it and doing it well provided one is sensible about the type of duty you expect it to perform. It does of course have some big advantages. It’s lower initial cost means that there is no need to run it for years and years before replacing it and its frugality on fuel usage, typically around the 22-24mpg mark though some are getting even more than that, is a major cost saving. 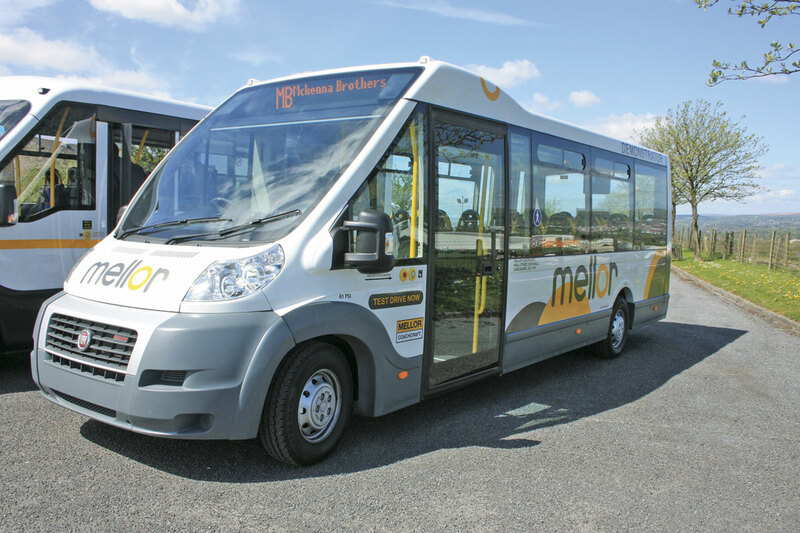 I predict we will be seeing a lot more Mellor Orion’s on service bus work in the future.